Last year saw the release of the Olympus OM-D EM-1, a body built for pros with a huge grip and tons of bells and whistles. 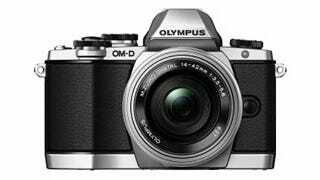 It looks like Olympus is starting out 2014 with another OM-D body, this time built for a slightly less advanced tier of buyers. These leaked images show the goods. These pictures aren't to scale, so don't judge their comparative sizes. The EM-10 is rumored to have the same 16 MP sensor and processor as the EM-1. It will feature 3-axis stabilization where the EM-1 has 5-axis. It will also be paired with the compact zoom lens which we posted about yesterday.